Every parent wants to give their child the world. When Matt Johnson’s son was born with Cerebral Palsy, he was told his child’s world was going to be very limited. Matt has learned not to take anything for granted, from the incredible team he built around his son, to the pain of running just beyond your body’s limits. Matt needed a team that understood the importance of understanding limits and knowing exactly when and how to push them. He chose Tiffiny Clifton, owner of Gotta Be Me Inc, a non-profit focused on creating an inclusive life for children and adults with disabilities. He chose Marne and Hans Iwand, owners of Mobility Equipment Restoration. They custom build and restore adaptability equipment from wheelchairs to strollers, creating unique pieces that respect each person’s journey through ability. He chose Steve Filips of Team Triumph, his own athletic ride-along program teaming veterans and civilians with disabilities with an “angel” to push them through marathons, triathlons, and other athletic events they have historically been excluded from. His team included a dozen area change-makers, but there was one new member of the family who couldn’t be left out. Tony Nguyening doesn’t see his part in Kaleb’s life as any huge contribution. Tony felt the drive to be someone’s Tommy. So now Kaleb has his devoted, loving parents, well-versed in his exact restrictions and limits, and he has Tony, the guy who knows that limits are set to be pushed. 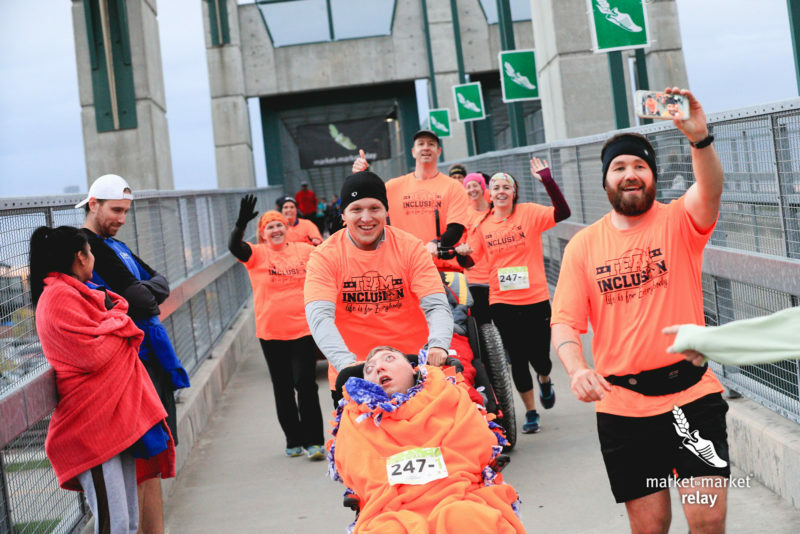 This year was Team Inclusion’s first Market to Market. 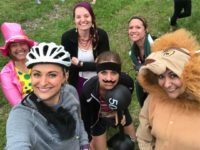 Their team consisted of 4 “captains” who live with varying degrees of mobility, all riding their chairs, and 12 “angels” pushing them the entire way. But Kaleb doesn’t have to wait a whole year to know his team is still showing up for him. Matt knows his son will never walk out the door and experience the whole world. That’s why he found people, organizations, and causes that can bring the whole world to Kaleb.